Moving from a high-poverty to lower-poverty neighborhood leads to long-term improvements in physical and mental health and subjective well-being finds a study appearing online yesterday in Science. Researchers from the University of Michigan collected data on participants in the Moving to Opportunity (MTO) program, a randomized housing mobility experiment. 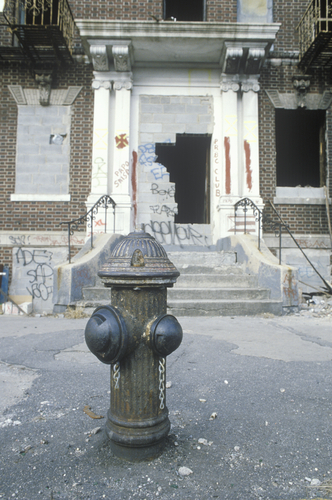 From 1994 to 1998, MTO enrolled 4,604 low-income public-housing families living in high-poverty neighborhoods in five cities. Families were randomized to three groups: one received vouchers for rent in certain more affluent neighborhoods, one received rent vouchers that could be used anywhere; and a control group that received no assistance. The researchers found that the chance to move to less-distressed neighborhoods—while having no long-term effects on economic self-sufficiency—had a large impact on physical health and a statistically significant effect on mental health. The improvement was equal to the level of life satisfaction of someone whose annual income was $13,000 more. “Our results suggest that living in distressed neighborhoods has more important adverse impacts, and escaping from such neighborhoods has more important positive effects, on the well-being of low-income adults than was revealed by previous [studies] that focused on traditional measures of socioeconomic and health outcomes,” the researchers said. An abstract of the study is posted here. For more about the link between poverty and mental illness, see Psychiatric Services. Could GHRH Keep Seniors Mentally Sharp? Can a New Eye Test Detect Schizophrenia?